Have you found an online vendor selling Black Coral Spiced? This rum has to be the worst I've tasted . I realize it's more of a budget type but there are FAR better choices out there . Artificial tasting almost like cough medicine - absolutely not drinkable by itself with just slight improvement when mixed . Black Coral rum is distilled and bottled in Riviera Beach, FL and is family owned and operated. It is a small-batch operation with great attention paid to detail. The describe their spiced rum thusly: "Our Black Coral Spiced Rum is carefully flavored using all natural ingredients, if it doesn’t grow in the ground it’s not in our rum. Our rum and these spices infuse to create a profile with an amazingly complex aroma and flavor. Not too sweet, and not too dry. Many enjoy it neat, but a few cubes and a splash of cola and you’ve got a drink that will slap a smile on your face. But don’t take my word for it, give it a try. If you like it then awesome, but of course you will like it, it’s delicious! And you can “pour with pride” knowing that you have helped a Veteran in need, by just enjoying a drink of Black Coral Rum." They also have the following on their website: "As a family owned craft-distillery, our product is our life. It is the water we fish in and the woods we live in. Our vision is one few ever see. Call us crazy, but, wouldn’t it make sense if people and moreover businesses based their goals not only on how to help themselves, but also how we can help others? And so we ask you to join us in helping a cause very close to our hearts, United States Veterans. There are so many young men and women that have given so much to serve our country, and are finding themselves in need. In light of these brave men and women, we have based this business on the pledge that $1 from the sale of EVERY bottle of our Black Coral Rum goes towards U.S. Veterans organizations." This rum is a light amber and swirling it in the glass snifter shows the same long legs as their white rum. I once again admit I am unable to distinguish aromas well but can only tell you if I find the aroma good or not. This rum's aroma is quite excellent. The flavor, however, is was makes this rum quite good. In the interest of full disclosure I want you to know that I am no expert and have had no training in recognizing flavors. I am merely giving you my opinions. The initial flavor I detect was cloves. And normally I hate...no...DESPISE cloves...however the folks at Black Coral rum make it work. Heck, even I like it. There are other spices at work here but are well blended to give it a complex delicious flavor. I taste a butteriness along with some vanilla and caramel undertones. Even though it's 80 proof (40% ABV) there's really no burn at all. Not even much of a warmth. It is remarkably smooth! Somehow they have managed to produce a very smooth spiced rum worthy of being sipped straight as well as in mixed adult beverages (try having a daiquiris made with this!). This is flat-out excellent rum. Seek it out. Buy it. It's worth every penny. A decent spiced rum with a good molasses flavor. It would go good with a cola or a cocktail but I don't think I would enjoy it neat. Had a rum tasting on a sunny afternoon, because why not. 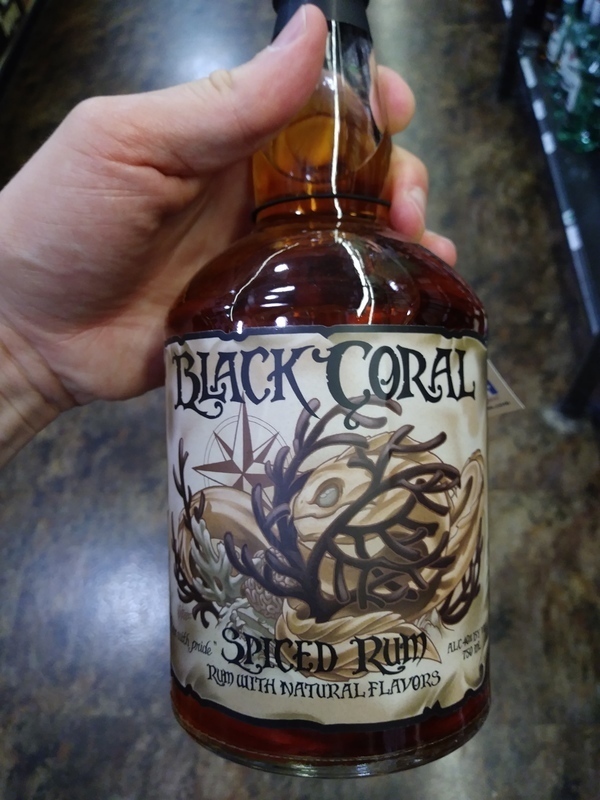 Black Coral Spiced Rum bottle and label design looks decent but nothing special. Strong alcohol and artificial flavors abound coming through to the nose and palate. Quite a harsh burn at the end, so better to mix it up with your favorite soda. Another Florida Rum I picked up a total wine to try out. Once again, I wasn’t disappointed. The Flavor profile was cinnamon, honey, citrus and slight peppery. I really want to like this locally made rum but it has an overbearing chemical taste. I drank it straight and in an assortment of mixes. I'm loathe to waste anything so I tried many combinations in an attempt to find it's forte. Perhaps their silver version is better. I really like this rum, and it's also an amazing value! Smells and tastes of cacao (possibly the main flavor, but not overly done), vanilla, spice, cinnamon, molasses, and oak. Really nice! In fact, this is one of my all time favorite spiced rums, along with the Koloa Spiced, and the Bayou Spiced. Very highly recommended! The best rum I have ever had! Compound that with the greatest people who are making it. I'll never buy another brand! Great rum, and great people doing great things. This spices rum is simply delicious and smooth. I enjoy it on the rocks and also what the company stands for. America! I was a vodka girl and I tried their tropical storm, which is the spiced rum, ginger beer and pineapple and I'm hooked! There's a hint of vanilla which makes it smooth, and it's gluten free!! This IS the go to spiced rum, period. We like it on the rocks with a twist of lime, but with sprite it is like cream soda. No hangover to this rum, not kidding. It is the opposite of all the cheap spiced rums on the market that smell and taste like diabetes, all those sugars will kill your gut. I don not drink coke, so i don't know how it pairs, but sprite is my jam, try it. And plus, they donate $1 for every bottle to a Veterans Organization near me. I will always support companies that support. BCR we love you!